When purchasing ZBrush from a reseller or through a third party bundle, a CD Code will be provided to you. It appears as three groups of three characters (letters and/or numbers), such as: A1B-2C3-D4E. Some resellers call this CD Code a “license key” or “activation key.” Regardless of what they call it, if it fits the formatting described above, it will be what the rest of this documentation refers to as a CD Code. Because your purchase was made through an outside company, we have no knowledge of it. 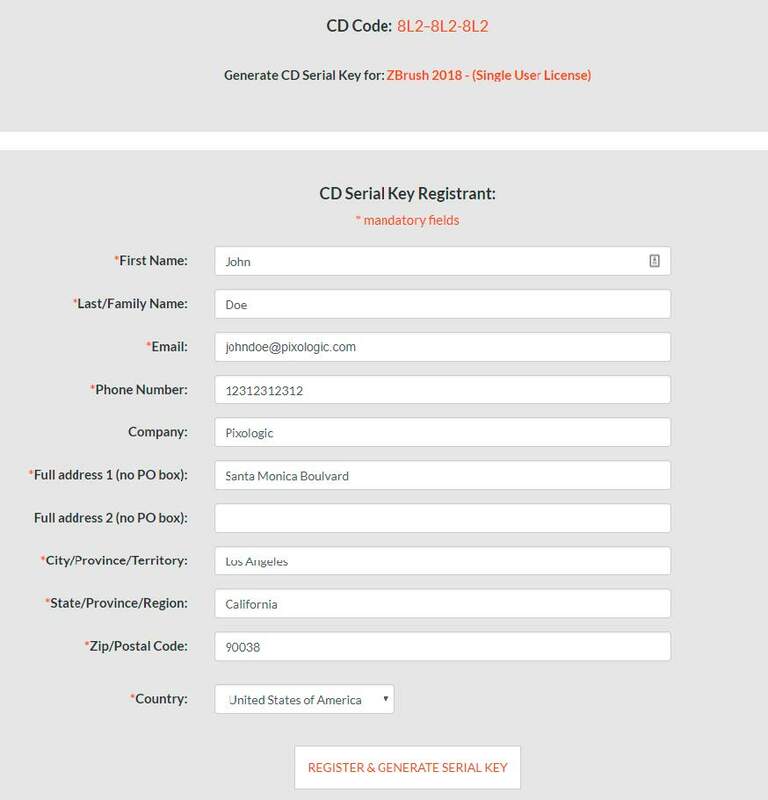 The purpose of the CD Code is then to create your account in the Pixologic system and verify that it was a legitimate purchase. Redeeming your CD Code is what will generate your license. Even though it goes through our shopping cart system, there will be no further cost to you. It is not possible to activate ZBrush until you have redeemed your CD Code! An option at the top of the page allows you to switch to a different language (1). Just below that, you have a field where you can enter the CD Code. Then click Submit (2) to continue to the next page. On the next page, the system will offer two possibilities: The first is to login with your Pixologic ID, if you already have one. The second is to create a new account. If you already have other ZBrush licenses or have previously created a Pixologic ID, choose the first option and simply connect with your email address and password. If this is your first time with the Pixologic ID system, choose to create an account – this will take you to the Registration process before returning you to the CD Code redemption process. The next page asks for your personal information. This is essential in case you need to contact us for any kind of support. Your ZBrush license represents a significant investment. For your own protection, it is Pixologic’s policy to only assist the person to whom the license is registered. Under certain circumstances, you may need to specify whether your license is to be for Windows or macOS. Under certain circumstances, the page may show that it is for ZBrush 4R8 rather than for ZBrush 2018. If this is the case, continue with redeeming your CD Code. After you have done so, you may immediately upgrade your license to ZBrush 2018 by following the instructions in the previous section of this documentation. When the form is complete, click the Register & Generate Serial Key button. If an error is displayed, it is probably due to a missing field or mistyped information. Correct the error and submit again. After validating the registration of your license, you will be given your license serial number. Keep this information in a safe place as it can be useful for support purposes. You will also be sent an email with a summary of all your license information. (This email may be misidentified as Junk or a Promotion by your email service provider. Be sure to check your other mailboxes if it does not arrive in your Inbox.) Again, we strongly printing this email and saving it for your records. You can now continue to installing ZBrush (below).